What is your role at Bodybuilding.com? I am a brand manager in the Sports Nutrition department. The simplest way to describe my role is to say that I am an internal advocate for our vendors. I work with a range of brands like Optimum Nutrition, Dymatize, ErgoGenix, and Vega. Our team comprises category managers and brand managers. Our roles are intertwined, which is often confusing for people. Category managers work with our vendors to watch category trends, plan promotion strategies, discuss margin, and help with product innovation. Brand managers ensure that the overall brand strategies are implemented, full circle. We work with nearly every department to deliver the merchandizing, marketing, supply/demand, and forecasting needed to help the brand be successful. Every single day is different. My job requires a lot of collaboration, which makes it really fun. I interact with many teams and attend numerous meetings on behalf of our brands. At the same time, I educate our partners on our internal processes and procedures. Our team is also responsible for planning product-knowledge training sessions to ensure that team members are educated on our brands and their latest innovations. And due to the nature of change, I end up putting out a lot of fires! I'm sure some people consider me to be a real pest and think "Oh no, here she comes again!" But seriously, one of the most enjoyable things about my day is that I have the privilege of understanding what a lot of other people do on a daily basis. I get to see the immense talent spread across this company. How does our mission resonate with your daily job? Miranda celebrates 3 years of service with Bodybuilding.com in November. We live in a time where everything is about convenience, and as a society, we've become lazy. This has led to the rise of obesity and other health problems. It's disheartening. It is really important to me that we provide such a huge resource to help people learn how to be their best selves and take care of their bodies. I am also touched by our Lift Life Foundation. It makes me feel good to know that we are changing lives through that foundation as well. What keeps you motivated to do your job well? I have a lot of fun with this job, but it can be stressful, because we are handling large financial transactions. I work with great vendors, and I love everyone I've met here. Working with good people is a huge motivator. Describe your job in 3 words or less. 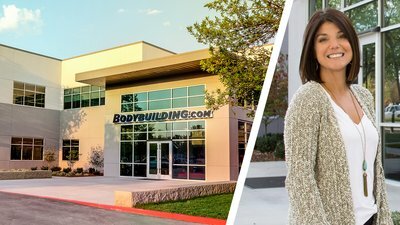 What does it take to work at Bodybuilding.com? You have to be super flexible and positive to be successful. This is a fast-paced environment, so you must be willing to roll with the punches and always find the silver lining to a problem. Knowing a good curse word can also be helpful! Why did you choose Bodybuilding.com? Miranda and her fox red Labrador, Molly, adventure outside and soak in the rolling views of the Boise foothills. I chose Bodybuilding.com because of the great culture. The company's mission really fell in line with my personal interests in health and fitness. Eating well and staying active has always been important to me. I also appreciate that the company values a work/life balance. I was working 80 hour weeks in my previous job, so this is a breath of fresh air. What makes you most proud of working for Bodybuilding.com? I'm proud that I get to work with such a gifted group of people on a daily basis. I've met some of the most creative, intelligent, and humble people at Bodybuilding.com. I feel that I am challenged every day to improve myself, and it is an honor to work with such talented peers. What is your favorite aspect of company culture? I love that I get to travel to see our partners all over the nation. It's a great opportunity to meet with them face-to-face, tour their facilities and see where they do their ideation. I also enjoy getting to know my co-workers outside of the office. There is a lot of pressure in sales, but we still have a fun atmosphere. Even when things get tough, we manage to laugh. And I love that the "slow clap" always seems to roll through the office at just the right time. What is the "slow clap"? It's just a funny tradition. One person will start a slow clap as a joke or to draw attention to someone in the office. The clap will gradually spread and grow louder and faster until it's full-on applause. We try not take ourselves too seriously around here. Describe the relationships you've built with co-workers. The Sports Nutrition team is super quirky, kind of like a very dysfunctional family. We can fight like siblings, but we really care about each other. At the end of the day, we always have each other's back. How has Bodybuilding.com influenced your health and fitness? Left to right: Miranda and gal pals crush 13.1 miles in the 2015 San Francisco Nike Women's Half Marathon. Joining fellow colleagues, Miranda ends a productive work day with a conditioning fitness class at headquarters. I really enjoy the Conditioning with Kandace class, taught by our VP of marketing; it is a huge motivator. I have dabbled in weights a bit, but running is what is most important to me. My brain doesn't stop (which can be exhausting), and I have found that a long run puts my brain at ease. I try to do at least one half marathon a year. Last year, I did the Nike Women's Half in San Francisco. This October, I completed Boise's Onward Shay half-marathon. I used to run for a better time. Now I'm like, "Whatever, I've got short little legs." I just do it because I love it! What motivates you to stay on track with your fitness goals? Left to right: Stepdaughter, Bella, motivates Miranda to be the best version of herself. The date is set for a September wedding next year for Miranda and Fiancé Kris. My fiancé has a little girl—she is my "bonus little person." I want to set a good example for her, so that keeps me motivated to work hard and to be healthy. And she is a competitive dancer, so I've got to stay fit to keep up! I have to admit that my dog Molly also keeps me motivated. She is my fur baby and the "home base" that keeps me grounded. She loves to run, too, so we are a great match. Do you have a favorite sport, fitness program, or Bodybuilding.com trainer? The TransFormed 12-Week Challenge by Dymatize is great. I really enjoy the broad range of athletes and how honest they are about their own struggles. I'm also impressed with the creative aspects of Steve Cook's Modern Physique 8-Week Muscle-Building Plan. I am constantly amazed at the quality of video and content that our Digital Publishing Group brings to the table. What is something very few people know about you? I used to work at an online dating website called Its Just Lunch. I guess I'm not much of a matchmaker, because it only lasted a few months! Anything else you'd like the team to know? We believe in our mission, and we’ve built a thriving team of people who truly want to change our customers’ lives-and their own-for the better.